Oregon pioneer Owen Hall Denny emigrated from Ohio to the Oregon Territory in 1852. Owen did well for himself; he worked the family farm, put himself through school, and became a lawyer and a judge. In 1877 he was named U.S. consul to Tientsin, China. Owen and his wife Gertrude Jane Hall Denny (also an emigrant to Oregon, and a survivor of the Whitman Massacre) spent three years in Tientsin, and also some time in Shanghai. At some point they decided it was a good idea to to see if they could establish a population of Chinese ring-necked pheasants in Oregon. “These birds are delicious eating and very game and will furnish fine sport” he wrote a friend. The first shipment of these delicious, very game birds arrived in Port Townsend, Washington on March 13, 1881. Most survived the ocean voyage, but the rough trip to Oregon from Washington proved too much for many. A few survivors were released on Sauvie Island. 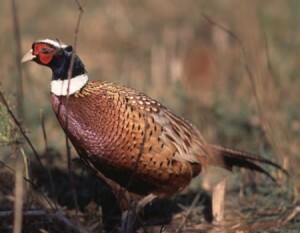 The Dennys had several more shipments of pheasants sent the following years, and these populated the Willamette Valley. This species of introduced bird is now quite common in much of North America.